It's time for some chocolate cookies! February is just a few days away and to me, the month is synonymous with Valentine's Day and chocolate. Needless to say, I'm a big fan of February and I'm ready to get an early start on the chocolate talk and consumption. Most of us know our way around chocolate cookies but these called out to me because they're pretty unusual ones, different from what I'm used to here in the States. It's a recipe from Jamie Oliver and, maybe not surprising given the British association, the flavor is a combination of chocolate and malt. Specifically, malted milk powder and crushed pieces of Maltesers provide the malt flavor. For me, there's so much that's unusual yet familiar about this cookie recipe. Growing up in Hong Kong for the first handful of years in my life, I'm fairly familiar with British eats and snacks, and malt as well as milk powder are some of those familiar things. We are also no stranger to condensed milk; I've been known to put it on toast occasionally. I totally thought of my husband when I saw this recipe. He not only loves malted things - as in drinks, milk shakes, and cookies - but chewy cookie are also his favorite. Happily, he was a big fan of these cookies and devoured them readily (though I admit he is hardly objective when it comes to my food). For me, I'd say these cookies are largely about the texture - they are very chewy and moist. The center is almost brownie-like (my husband goes so far as to say they're like a chocolate truffle). Those are all good things. Now let's talk flavor. The malt factor isn't overwhelming but to be honest, neither is the chocolate. I used 70% bittersweet Scharffen Berger chocolate in these cookies. It's a dark chocolate with strong overtones that you usually can't miss. Here, the sweet condensed milk wipes those flavors out so you don't get intensely deep chocolate taste. Personally, I prefer chocolate intensity so that's not a selling point for me. However, life is about variety and this is a great cookie experience for that special chewy texture and sweetness. It's just important to go into things knowing what to expect. Making cookies is always fun and it was interesting to mix up this slightly more unusual cookie dough. I divided the recipe in half, which turns into a dozen cookies. The recipe originally calls for self-rising flour. Since, I've never seen self-rising flour in my supermarkets, I simply added baking powder and salt to regular all-purpose flour and went from there. You can almost tell how thick and chewy this cookie will turn out to be when you look at the thick, glossy batter after the dark chocolate has melted and been stirred together with the condensed milk. Maltesers - they are essentially the British version of our Whoppers. 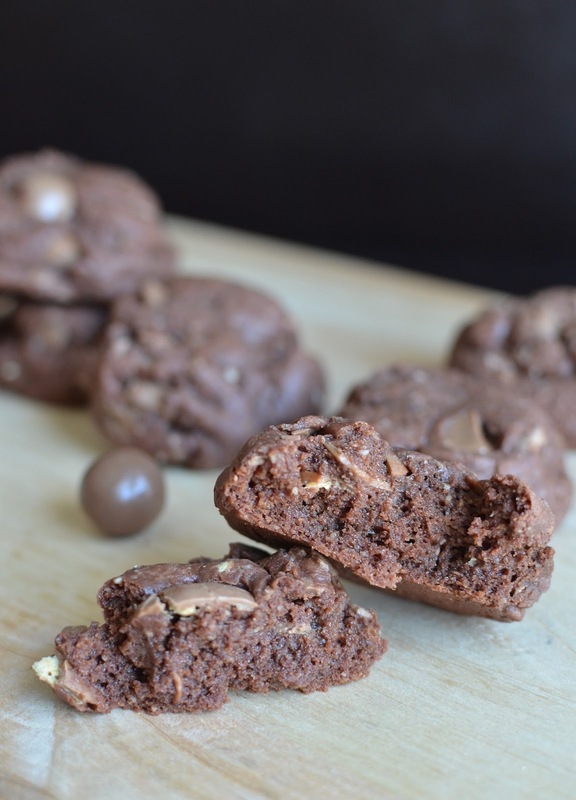 You could certainly make these cookies with Whoppers but I bought Maltesers from a specialty food store and sometimes they're even available at bigger grocery stores. I placed the Maltesers into a sandwich bag and gently crushed them with a meat mallet (you could just use a wooden spoon). You can leave larger chunks like I did or break them down further if you like. I am glad I went with milk chocolate as opposed to white chocolate for the other mix-in. The cookies are definitely on the sweet side and while the white would have looked nice as a contrast, I just prefer the milk, which melded with the Maltesers nicely. On the topic of the chocolates used in the cookies, do use a dark bittersweet chocolate. You need that 70% level dark chocolate to offset the sweetness from the condensed milk and candies. The cookie dough needs a few hours in the refrigerator to cool down and firm up. After scooping, gently press them down a little. They don't spread very much while baking and the thick centers give you that big, chewy, brownie-like texture. You can store the cookies in an airtight container for a few days and they stay nice and chewy. I baked off most of the dough and kept a few in the freezer for another day. That's the neat thing about cookies dough - you can stow some away in your freezer for an 'emergency'. And cookie emergencies tend to come up constantly, don't they? At the time of this publication, all these cookies are gone. I'm glad I tried this Jamie Oliver cookie recipe. And speaking of the man, isn't his food stunning?! It really wasn't until I started watching Jamie Oliver's 15 Minute Meals (aired on CBS a while back) that I appreciated how creative and visually appealing his food is. The show was a feast in so many ways - as far as the food itself, the cinematography, the presentation...it was an eye opener and I was really impressed so nowadays, I keep an eye out for Jamie Oliver recipes. In a bowl, whisk the flour, baking powder, and salt together. In a small saucepan over low heat, melt the butter and bittersweet chocolate until just smooth and combined, stirring occasionally. Remove pan from the heat and stir in the condensed milk, followed by the almonds and milk powder. Add the flour mixture and stir together until just blended. Transfer mixture to a bowl and chill for about 15-20 minutes until cooled but still pliable (do not chill too long or the dough may be too stiff, making it difficult to stir in the other ingredients). Place Maltesers into a sandwich bag and crush gently into bits. Add the smashed Maltesers and milk chocolate into the cookie dough and mix together. Scoop the dough into 12 balls. Flatten each cookie slightly (you can freeze the cookie dough this way to bake for another day) and bake until chewy in the middle and just firm along the edges, about 12 minutes. Let cool on baking sheet for about 5 minutes, then transfer to a cooling rack to cool completely. Tea is perfect with these given the sweetness. Although I think just about everything goes well with a cup of tea! Malt is really under used in baking and why I am so excited to try these cookies! I like it, too. I feel like it adds a little something in the background that makes chocolate desserts even more interesting. I share your weakness, Betty! Malt, all kinds of milk and glucose powders, condensed milk, digestive biscuits, butter cookies - those all the kinds of sweet things I grew up around. It makes this recipe both unusual and familiar to me...really interesting to try. So pleased to see these on my iPad today whilst having lunch Monica! I have been 'eyeing' these in 'Comfort Food' for sometime now as my kids are big Malteser fans. It's great to hear your tips on making them and they certainly turned out glorious! Yes, Jamie is hugely popular here. He has a monthly magazine that is also very addictive. Maybe you could get it in Barnes & Noble...? Have a good weekend and stay warm! Yay - so glad you caught this and thanks for sharing your input, as always! They do carry his lovelymagazine in B&N here. I love to check them out (as well as Donna Hay) when I get the chance. I'd heard of him for so long but really never knew what type of food he cooked. Now I drool over his instragram feed quite a bit. Have a great weekend ahead! They look just like mini chocolate cakes :-) Love the add of maltesers! Baking with maltesers? Yes! Yes! Yes! Maltesers are so much better than whoppers!!! I can eat a whole bag in seconds! One time, I had my parents brought me a bunch of maltesers from HK since they are cheaper there. Love to try these cookies! These cookies look so rich and delicious!!! Amazing! These look amazing, Monica! And I think I'd have gone with milk chocolate too, just to add to the whole malt flavour thing. Yum!! These cookies are making me so hungry! I need one right now! These will be perfect for Super Bowl this weekend! Monica - all your posts are great - but this post is fascinating! I love Jamie Oliver recipes so this really speaks to me. Okay I also adore the chocolate but wow! Malted Milk balls are a favorite of my husband so I will be tucking this recipe away for a special day. Have a wonderful weekend and thanks for the wonderful recipe! Hi Monica, I adore Jamie Oliver recipes, the guys is a genius. But I also love all things malted, looks like a very interesting and delicious recipe. Great idea about freezing the dough. His food is just beautiful. I really never realized that until I saw one of those shows on CBS and started watching that series. Yes, definitely keep some homemade cookie dough in the freezer. Have a great weekend! All of my favorite things in one recipe... delish! Cookies are always winners, I think. Thanks for stopping by, Gloria! Oh, I know what you mean. Our school's policy has changed to no candy/chocolates at all anymore...and we are not allowed to bring any food to any parties or occasions even if homemade. Sometimes not watching tv is a good thing, and sometimes it leaves me sadly ignorant about topics like inspiring chefs and the foods they create. I certainly have heard of Jamie Oliver, but I couldn't have told you much beyond that. Though your glowing recommendation for his recipes is enough for me, the added endorsement of all of the comments make it clear that I am missing out! (Off to the library I go!) These cookies make a good case for his recipes as well! :) The texture sounds wonderful, chewy cookie with crunchy candy. The differences in national taste preferences is fascinating to me. British chocolate candy (like Cadbury) is extra milky. Your warning about the sweetness of this cookie makes me think that maybe I will try them with all dark chocolate instead of the milk chocolate. Less pretty contrast but less sweetness too. Yes, Wendy...that show was eye-opening. The cinematography was awesome and the food was just so beautifully and effortlessly prepared by him. Cadbury milk chocolate has a special place in my heart too. I think dark chocolate would be great here. In fact, I think it's the condensed milk as sweetener to get that sticky, chewy texture that I take away from this recipe. First of all - YOUR NEW (at least new for me hehehehe) BLOG DESIGN LOOKS ABSOLUTELY GORGEOUS! Girl, they are perfect cookies. We love malt cookies, I really need some now. Are you planning on bagging some for school? The season of cookies are here, so perfect for valentines. Awesome my friend, Pinning. hugs. These were really interesting...real chewy and on the sweeter side. My husband loved them in particular. You will have time to bake one day soon for sure. Simple cookies would be a great way to go...as would muffins, quick breads, so many things that you don't need me to tell you about!